A child today is just as likely to play with a stick they’ve picked up off the ground as a specially made toy. The painting Children’s Games by the Dutch artist Pieter Bruegel the Elder shows this was also the case in 1560. It is an extraordinary record of the types of games and playthings children used and made, depicting over 250 children taking part in 80 different activities. Many did not use specially made toys, instead the children have made up games using objects they found. 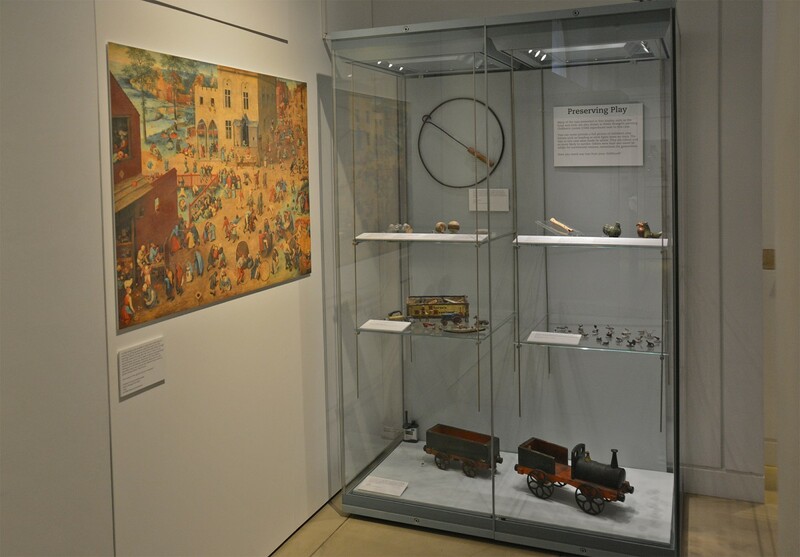 Many of the toys presented in this section, such as the hoop and stick, are also shown in Pieter Bruegel’s painting. Toys can never provide a full picture of children’s play. Games such as leapfrog or stick fights leave no trace. The toys in this case were made by adults. They are robust and so more likely to survive. Others were kept and saved by adults for sentimental reasons, sometimes for generations. Children’s Games (Kinderspiele) by Pieter Bruegel the Elder, 1560.